Mini greenhouses and grow racks are designed for those with limited space. 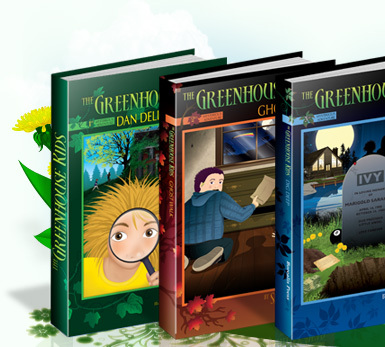 They are small greenhouse designs that can be used inside or outside in places where a regular greenhouse would not fit. Create a mini greenhouse with this 2 tier greenhouse grow rack. Perfect for flowers, plants and seeds. Greenhouse conditions are created by using the plastic cover! 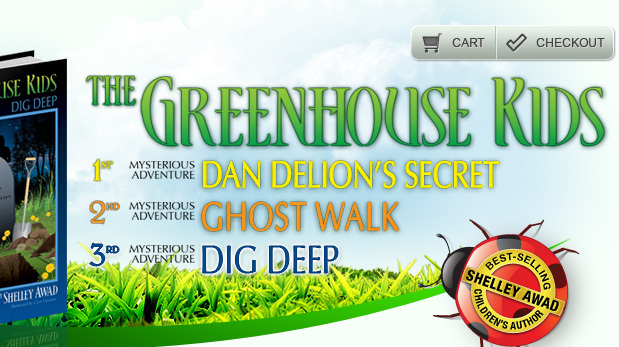 Great for use in the greenhouse or suitable for decks, patios, indoors or outdoors! Wonderful to use as a plant stand or for starting seedlings. Features a removable UV-coated plastic cover. Allows greenhouse gardening in small spaces. This juliana replacement UV-coated plastic cover fits the Juliana 2 Tier Grow Rack. Creates a mini greenhouse to start seeds and hold plants. This Juliana mini greenhouse lean-to offers the same features as the larger lean-to greenhouses. They are particularly practical for those who have limited garden space, or for growing only a few plants. 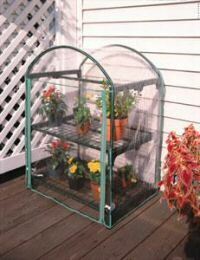 A cost effective solution for any gardener who wants a small greenhouse! 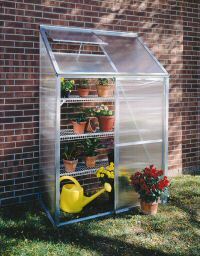 The mini greenhouse lean-to includes 4mm polycarbonate panels that fit inside of the aluminum lean-to frame for a strong and clean design. A single sliding door and a roof vent provide ventilation. This is a great starting unit for those with limited space. A great mini lean-to for kids as well! Easy to install. Solar powered roof vents are optional. There are two sizes to choose from. To order greenhouse accessories or solar powered roof vents, please proceed to checkout and view related items. 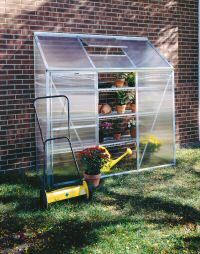 The Juliana mini greenhouse lean-to includes 4mm polycarbonate panels that fit inside of the aluminum lean-to frame for a strong and clean design. A single sliding door and a roof vent provide ventilation. This is a great starting unit for those with limited space. A great mini lean-to greenhouse for kids as well! To order greenhouse accessories or solar powered roof vents, please proceed to checkout and view related items. Please note that benches shown in photo are not available and they are not included.